Before becoming the Albany Park and Playground, this area was known as Strevy's Grove. This was a popular gathering place that had a large pavilion were many reunion's, picnics, and dances were held during the summer. The Strevy's had an ice cream, candy, and soft drink stand that they opened for business during these activities. A small lake was also in the Grove which made an excellent place first skating in the winter. The Grove is long gone now, but was replaced by the New Albany Park and Pool. In 1926 the New Albany swimming pool began construction and opened in 1928. The pool was located on land that once was the town baseball field. Frank Packard was the contractor. Ray Wilcox, owner of the New Albany Water Company, thought of the idea that a swimming pool should utilize the surplus water in the reservoir made possible by the circulatory water system. The pool was operated for a time as a private enterprise for the use of Donald, son of Mr. and Mrs. Wilcox. Later the pool was opened to the public and a small admission fee was charged. Under state specifications for forest purposes, the pines in the background were planted in 1930. The Park grounds were landscaped at the same time. When a freshman of New Albany high school, Donald Wilcox died on January 18, 1937, following an attack of appendicitis. Mr. Wilcox lost interest in the pool after his sons death, and it was feared for several years that it would not open. Mr. Wilcox had wished to have the pool and the water company go as one unit is sold. After his death, the pool was leased to the borough in 1943 for one dollar for the season . After the death of a majority stockholder, the New Albany Water Company sold the Hatch Hills Springs to New Albany Borough for $13,500. The Pool was included in the purchase for approximately $2,000 more. The Borough leased the pool to various private operators and reserve the right to main or terminate leases. Barry Walp, Grover Worthington, Paul Lee, and James Magee were some of the early operators. In 1953 reported attendance was 15,000. Each year more restrictions, rules and regulations were enforced which made it impossible for the managers to make a profit. In 1993 the pool had its final season. 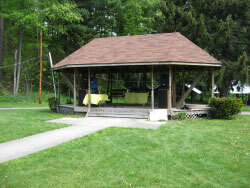 The park and pavilions continue to be used during the summer and fall for reunions and special events, and the new gazebo was erected over the site which was pool.